Do you need help determining how best to travel to Wakayama? Find practical travel information here. Learn about gateways, transportation modes with approximate travel times, as well as tour operators that can assist you in planning your optimal itinerary and route. Located on the Kii peninsula, Wakayama Prefecture belongs to the Kansai region, which is also home to Osaka and Kyoto. Wakayama City, the prefectural capital, is 1 hour by train from Osaka and 1.5 hours from Kyoto. Located only 40 minutes away, Wakayama City is the closest major urban center to Kansai International Airport (KIX), which has nonstop service to 75 cities around the world. Other major international airports include nearby Chubu Centrair International Airport, Nagoya (NGO), as well as Haneda (HND) and Narita International Airport (NRT) several hours away in the Tokyo area. Domestic airports in Kansai include Osaka (IMT) and Nanki-Shirahama (SHM), which is only 20 min from Shirahama Station. Regardless of the airport you use, each is served by good transport links, with connections to bullet or rapid trains and highway buses readily available. Taxis and car rental services are of course also available at all airports. For travelers arriving at KIX, the airport limousine bus operates a service to central Wakayama City approximately every 30 min to 1 h; it conveniently stops at JR Wakayama Station. To view estimated travel times to Wakayama, select a port of entry. 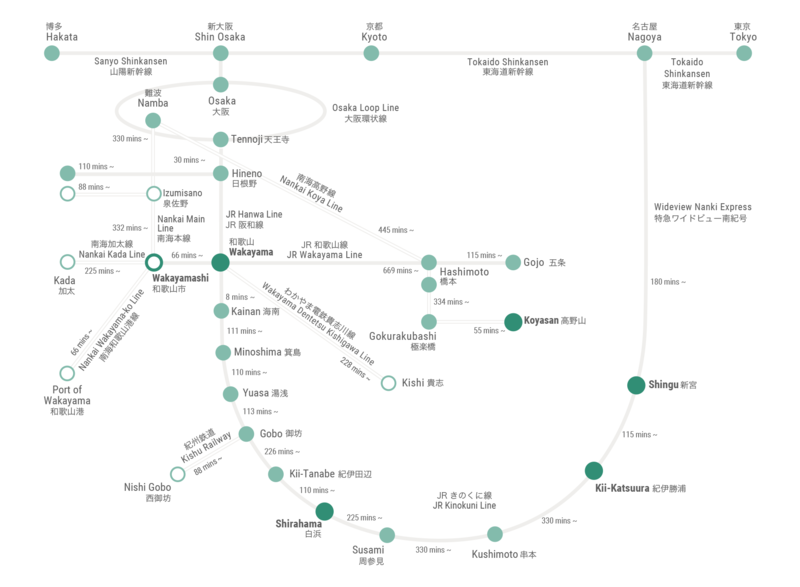 Japan's extensive train network is both extremely efficient, and convenient. Select your port of entry, to find out approximate travel times and recommended routes. Rail coverage in the Kansai area, is provided by Japan Railway West (JR West) and Nankai Denki Tetsudo (Nankai Electric Railway). Travelers arriving in Nagoya, can take advantage of the Japan Railway group's Central service for easy access to Wakayama via the Ise Peninsula. International visitors entering Japan on a “Temporary Visitor” visa, are eligible for various rail passes and discount tickets. Each individual pass has its own terms and conditions regarding area coverage (e.g. 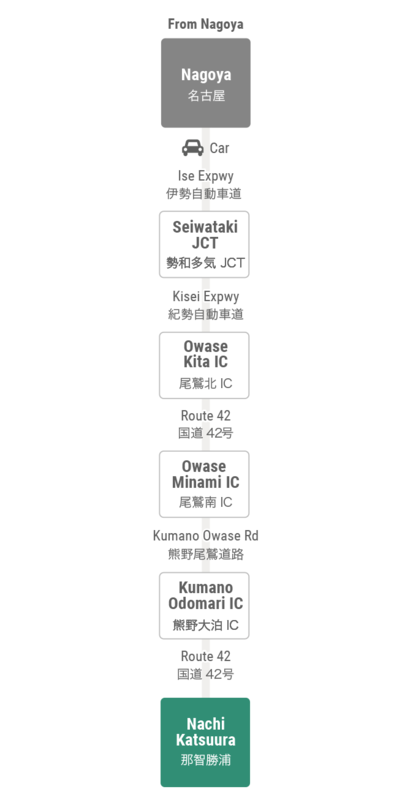 Kansai area only or Kansai wide area), eligible train services (e.g. bullet trains included, or only rapid service and local trains), validity period (consecutive or non-consecutive use) and additional perks that entitle the bearer to discounts, on such things as admission to tourist sites, and purchases at souvenir shops. Major cities experience peak rush hours between 7:30 - 9:30 a.m. and 5:00 - 8:00 p.m. when train stations are highly congested, and not easily navigable. Keep this in mind, when planning your travels. Japan Railway Group offers numerous rail passes, from country-wide to regional-access (e.g. JR West, JR Central) passes, however pay particular attention to which must be obtained prior to entering Japan. The ‘Japan Rail Pass’ is available for country-wide usage, and offers 7-day, 14-day, or 21-day consecutive use, but must be pre-purchased prior to arriving in Japan. It can be used on all JR Group bullet trains (except Nozomi and Mizuho), buses and the Miyajima ferry which provides access to Itsukushima from Hiroshima. The ‘JR West Kansai WIDE Area Pass’ provides a 5-day pass, on unlimited non-reserved seats for specific bullet, express and rapid service trains covering the Kansai Wide area. This pass includes coverage between Nara and Wakayama City, and perimeter service along Wakayama's coast all the way to Shingu Station. It can be purchased in Japan. The ‘JR West Kansai Area Pass’ provides 1 to 4-day tickets, with unlimited service between Kansai International Airport and Wakayama Station, and service to other major cities in Kansai, such as Osaka, Kyoto, Kobe, Nara and more. It can be used for the Airport Express, Special Rapid and local services, however bullet train and most limited express train coverage is not included. This pass can be purchased in Japan. The ‘JR Central Ise-Kumano Area Pass’ provides unlimited train and bus service between Nagoya Station and Kii-Katsuura on limited express to regular service trains. In addition to covering non-reserved seats, it can be used up to a maximum of 4 times for reserved seats. In the Kumano area, it includes transport on Kumano Kotsu buses to Nachisan, and the Kumano Sanzan Shrine Hongu Taisha along with other local areas. Nankai Denki Tetsudo offers 2 passes that include train and bus service: ‘Kansai Thru Pass’, and ‘Koyasan-World Heritage’. The ‘Kansai Thru Pass’ provides three or two-day non-consecutive use tickets valid in Kansai, and includes coverage to Wakayama and Koyasan Stations. Unlimited rides are available on specific train and bus lines. The ‘Koyasan-World Heritage’ ticket, covers round trip transportation between Osaka’s Namba Station and Koyasan, and offers discounts on admission to several Koyasan sights and on purchases at local souvenir stores. It is valid for 2-days, and can also be used for buses in the Koyasan area. Limousine and highway express buses offer a hassle-free way to get into central Wakayama. Avoid struggling with luggage in busy train carriages, and at stations without elevators by taking advantage of this door-to-door service from any key transportation hub (airports, major train stations). From Kansai International Airport , buses bound for central Wakayama and stopping at JR Wakayama Station depart almost every 30 min to 1 h. The journey to JR Wakayama Station takes only 40 min. If you are travelling to Wakayama from further afield in Tokyo, there are some affordable overnight buses that allow you to save on a night’s accommodation. Overnight buses run to both Wakayama City and Shirahama Onsen. Driving to Wakayama will give you the freedom to set your own pace, providing an easier way to access many of the magnificent more remote areas. There is no need to worry about getting lost with Japan’s sophisticated GPS coverage. An onboard navigation system will offer the best routes, traffic jam updates, expressway entrances/exits, parking and rest stop (michi-no-eki) information. Car rentals are available at major airports and city centers. Electronic Toll Cards (ETC) for the Central Nippon Expressway network are available at Nagoya’s Chubu Centrair International Airport (NGO) with attractive flat-rate toll packages for international visitors, including 2 to 14-day plans. Book in advance, to ensure access to vehicles with multi-language GPS available at both Kansai International (KIX) and Nagoya Chubu Centrair International (NGO) airports. As a backup having your smartphone, USB charger and stand, can also be an alterative on the go navigation device. For families traveling with children, request child safety seats when making your booking. Remember to bring your International Driving Permit (IDP) to legally drive on Japanese roads. Japan drives on the left side. Roadmaps and guides on driving in Wakayama are available in Download Maps & Brochures. From Nagoya, approx. 210 mins to Katsuura, approx. 240 mins to Hongu. Ready to book but the only thing stopping you is the logistics? We recommend looking at our list of tour operators, to find one in your region. All bookings are managed by operators directly.